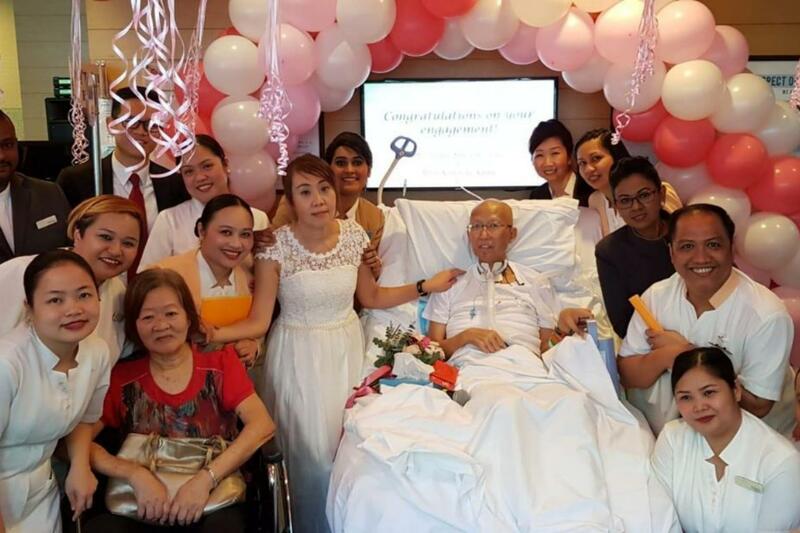 SINGAPORE - He proposed to her last month while she was by his bed in the hospital ward, despite having breathing difficulties from his illness. On Saturday (Dec 15), Mr Pang Ming Kwong, 58, who has terminal lung cancer, exchanged engagement rings with his fiancee, Ms Koh Soh Kuan, 49. The couple have been together for more than eight years, since they first met at a tea appreciation event. Ms Koh said: "We have been meeting almost every weekend. He calls me almost every day and tells me about his work. We have both been busy working, but he always says he treasures every moment that we spend together." Saturday's engagement ceremony was a surprise for her when she learnt about it a few days earlier, as Mr Pang was often drowsy from his medication and she was not sure what he had in store for her. The hospital's staff put everything together, said Ms Koh, adding that she was very thankful to them and was very touched by Mr Pang's gesture. "He always asked, 'What date is it'? How many more days to the 15th?" she said. The Endoscopy Centre was decorated by hospital staff for the engagement ceremony. "We were so excited when we first learned that Mr Pang wanted to hold an engagement in our hospital, and the Ward Eight team wanted to make this event special for him."